Recently, as I escorted a candidate around the office between interviews, the individual took the time to praise our selection process. He mentioned that he’d been interviewing with a number of other I/O firms, but thought that, while all of the firms clearly had expertise in this area, we had done a really nice job putting it into practice with the process he was currently navigating. We’re happy to take the compliment, but it sparked the idea that maybe we could talk a little bit about how we approach selection and some of the changes and refinements we’ve recently made to improve upon what was already a pretty decent process. First a little background- the goal of our selection and assessment process is to select the most qualified candidates using a fair, efficient, and rigorous process. 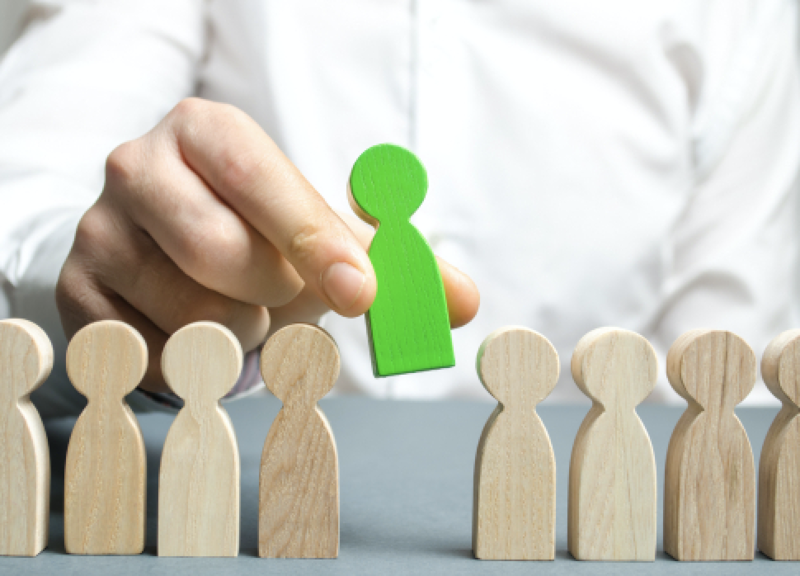 We engage nearly our entire workforce in interviewing as we believe that it not only allows everyone to contribute to the growth and success of FMP’s workforce, but it exposes everyone to selection and assessment, a core capability and service offering of FMP. We say ‘nearly everyone’ because we typically have new hires wait about 6 months before they go through our interview training (yes, we have training on how to interview at FMP- more on that later) so that they can feel comfortable speaking to candidate questions about our culture and sharing their own project experiences. Once they’ve been onboard long enough to feel comfortable, we love having recently hired people involved- it allows them to compare and contrast what makes FMP’s culture or work different and therefore provides our candidates with a more realistic preview of what to expect if they joined our team. Additionally, recent hires still remember those things that surprised them or that they didn’t fully grasp during their own interview process- those first-hand stories can help a candidate get a clearer picture as we try to describe our culture. About 2 years ago, we decided to review and refine our selection and assessment process, an undertaking that was led by a number of FMPers- leadership, HR, and consultants. While our previous process was sound, we thought that we could reduce the amount of time spent per candidate (approximately 10 FMP hours per candidate) and the number of individuals who made it past the first round and on to our second round (approximately 80%). Taking a fresh look at our process (and leveraging in-house expertise in selection and assessment, business process improvement, and custom tool development), we revised our approach. 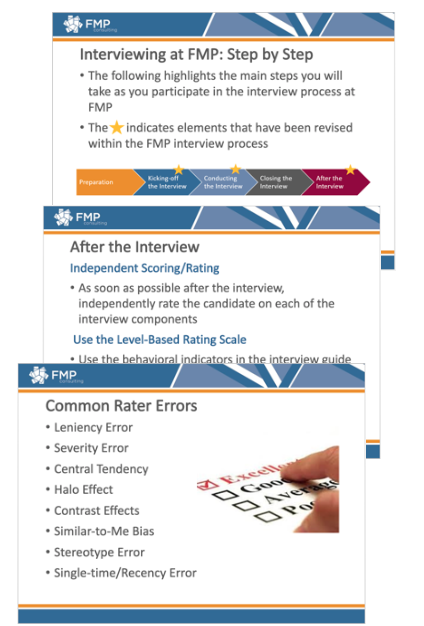 To increase the rigor in the first-round interview and send stronger candidates to the second round, we refreshed the competencies, questions associated with these competencies, and behavioral rating scales used within our assessment materials to enhance rating consistency and better reflect our current workforce needs at each career level. We also developed a library of behaviorally-based technical competency questions for specialized positions- particularly those that were proving to be more difficult to fill. Additionally, we built a web-based interface (using Knack) that allows us to track candidates through the process, store interview materials, and capture interviewer feedback and scores that can be used to help shape second-round interviews by interviewers that have access to the first-round output. While we have an existing applicant tracking system (ATS) as a component of our Human Resource Information System (HRIS), we wanted greater ability to customize and drill into our selection process data and found this to be a quick and easy-to-use tool. Finally, we developed a very thorough interview training that we conducted with our workforce and which we continue to offer annually. The training allows our I/O psychologists to showcase their passion for selection and assessment (as they tend to be the presenters) and allows our workforce to share practical advice with new interviewers. As with any process improvement, the effort isn’t complete until you’ve evaluated it and determined whether the changes have actually made an improvement. True to form, one year out, we conducted an evaluation of our revised selection and assessment process that showed that the addition of the Knack tool significantly improved the experience for our HR Lead/Recruiter, our interviewers, and hiring managers. Additionally, our process revisions allowed us to save up to 6 hours of FMP time per candidate and instead of sending 80% of candidates on to the second round, we’re averaging 50%. While our evaluation also showed that we can continue to expand guidance for conducting interviews and rating candidates and explore additional interviewing techniques (e.g., situational judgement test, work samples), we are really proud of the process that we use to select new team members. We also feel good knowing that candidates recognize the effort and intentionality that we put into our selection and assessment process- that in and of itself creates a first impression that speaks to the value we place on hiring talent that fits with our culture and focusing on quality in everything we do.